What Are Deformed Strawberries Called? There are different names for a deformed strawberry. The most common two names for such berries are “nubbins” and “button berries.” Of course, the more generic adjectives are also often applied: mutant strawberries, deformed strawberries, runt strawberries, monster strawberries, etc. There are two main types of misshapened strawberries. The nubbins and button berries are the first type. The second type is referred to as cockscomb strawberries or fasciated strawberries. Each type of deformity is caused by different agents and can be lumped together in general groups. The button strawberries or nubbins are caused by external damaging agents, while the other deformities are more benign. 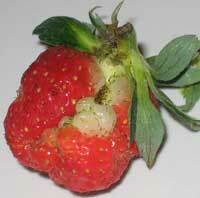 Nubbins and button strawberries are caused by external, usually damaging agents. Feeding by tarnished plant bugs or certain types of mites will cause them. Cold injury (specifically frost damage to the pistillate part of the flower) and nutrient deficiencies (particularly a lack of calcium or boron) will cause deformed strawberries to form. Additionally, inadequate pollination can result in poorly formed strawberries. Another cause for the formation of nubbins is very hot temperatures (the high temperatures damage the pollen viability). And, lastly, the application of the 2,4-D amine formulated weed killer (Amine 4), which is commonly used in the first step of traditional strawberry renovation, can cause deformed berries if sprayed while fruit buds are forming during the months of August and September. The other type of deformed strawberries have a cockscomb or fasciated appearance, hence their name. Fasciated strawberries and cockscomb strawberries look like several strawberries have fused and grown together as a single fruit with multiple points. This deformity is usually caused by either short daylight intervals or cold, dry weather during the fall. Often, the deformed strawberries are produced on strawberry plants when varieties developed and adapted for northern growing are instead grown in southern regions. No one wants to grow deformed strawberries. But, occasionally, the dream of harvesting bushels of bright red, perfectly-shaped strawberries dies a cruel death on the rocks of reality. If you find yourself plucking puny and puckered fruits, evaluate the conditions in which the strawberries are grown. You may have a pest infestation or soil deficiencies. Or, you may have simply planted a cultivar that is ill-suited to your location. For each problem, there are usually steps that can be taken to remedy the problem that is causing your deformed strawberries. A good place to begin for information on successful strawberry cultivation is the Growing Strawberries page. I love my little strawberry plant. It’s in a Tara cotta pot…foliage looks good except for the occasional leaves turning orangish yellow. The first strawberries it produced were tiny but very sweet and yummy. Now there are dozens showing up. But I have one flower that looks like it’s trying to grow 3 or 4 berries out of it. It and tally looks like a little birdie. Two parts of the berries are turning red so far but they are smoother than the other berries on that he plant. I know that sounds wierd but I’m wondering if it will be edible when fully ripe? Should I cut off the runners and first blooms? Also I am worried about insect ifastations and the like. Can you help me? I really want new plants, but it says that I should cut the first flowers and runners off. Hello. I am eating my strawberries and it seems to have green seeds, and the tip of the berrie is sort of smushed. Can i eat it? If the strawberry is discolored, it is best not to eat it. Good luck! I have some strawberries that are not doing well. They are deformed, but don’t seem to be like the examples shown. The seeds leave pock marks in the berries and they don’t fill out correctly. Someone suggested that it could possibly be some type of virus causing it. Here is an example of the berries. Some strawberry varieties will naturally look like that. Do you remember which varieties you planted? I live in Central Oregon at about 4,200 ft. We have had a very hot summer in the 90’s to 100 degree days and no freezing nights this year. However, my strawberries have developed little brown spines on the berry. They are prickly enough that you can’t eat them. Some berries have them and some don’t on the same plant ? They are watered well. Is this caused by the heat or the sun ? No, exposure to the sun won’t cause spines to form on the berries. They may be egg castings from an insect. Can you send a picture? Our strawberries have been a disaster this year, which was our first attempt. Every fruit is small and deformed. We are in northern Virginia where we have 80-90 degree temperatures pretty consistently. Is it likely to be the heat? The soil is mostly miracle grow fruit&veg and we water pretty regularly. Any thoughts? We planted in April/may, its now July and the plants have really struggled. Just a quick inquiry .. I have been growing strawbs for some time and have had great results especially after feeding the soil ..I have recently liberally used alpaca poop and the crop has been astonishing in terms of size and quantity … there have been some very large fan shaped fruits almost touching either end .. is this deformed or is is super-growth ? ..
No, those are not deformed, just really big strawberries! Good luck! My strawberries are growing really well in a raised bed. Large strawberries that have ripened but have two tips that are green! Any ideas ? Look really suggestive !! The tips of the strawberries are the last part to ripen. If you give them another day or three, they will likely redden like the rest of the berry. Sometimes, however, they hold out. If the rest of the strawberry starts to get soft or over-ripe, go ahead and pick the affected berries and just slice off the hard green/white tip. Good luck! My strawberries are not only deformed, they are soft and squishy. Any thoughts as to why? The two most common reasons for soft and squishy strawberries are them being over-ripe or starting to rot after insect or animal damage. Good luck! I have these mutant strawberries. They look quite whole and healthy and are a great cause of amusement when I show them to people. However they have a wonderful taste and are lovely and sweet. They are also prolific. I have other normal straws’ too, English varieties – is there any other kind worth having, I hate those dark red gargantuan Spanish ones. They’re hard and often sour or bitter. Give me the sweet Frankenstein ones, one of which I found wild in my tiny garden two years ago. It throws out lots of runners so not hard to grow. Do you know of any organic ways to get rid of my tarnish bugs? You can try a liberal sprinkling of diatomaceous earth. Good luck! How do you plant the little baby plant that grows from a mature strawberry? Do you just put them into the soil as is or do you have to put them in water first to form roots? If you have already germinated the seeds, yes, just plant them in the fertile soil. If they haven’t yet germinated, this can help. Good luck! Just stick them into the soil and they will root. I planted Tristar everberries and was told at the nursery that those are the top strawberries. I planted them in a composted patch, enough water and sun, they are between a peach tree and a nectarine tree. They are facing South so they might be a bit too hot. All the fruit is delicious and juicy but in a shape of a button mushroom. What could be wrong ? Last summer was cooler than this summer, but I always water them and make sure the soil is damp. No weeds, they are in round patch. Did this ever happen to you ? No, I’ve never had that happen to me. If there are no signs of damage/insect feeding, and the strawberries still taste normal, I wouldn’t worry about it too much! They might be shaped that way due to the specific composition of soil minerals/nutrients. You may want to have your soil tested just in case. Good luck! Thus is my first berry plant…and it looks like they have big green warts on them…right after the flower starts to fruit…..what’s that about?? I’m not sure what that would be. I’m sorry! You may not see them, but it sounds like you’ve got some sort of pest. If you want, you may want to review the list of pests on this page. Good luck! I would say around 50% of my strawberries are deformed so I am getting some normal shaped berries. The plant is very healthy It is early summer and we are having some late frosts so I`m not sure. The plant has just developed some runners. I need help on how to fix my deformed strawberries without all the fancy pants stuff. Make sure your plants have enough nutrients and no bugs on them. Also, make sure that the weather isn’t too cold. Good luck! Ok, my “deformed” strawberries aren’t really deformed at all, but extremely tiny, like pea sized but well shaped for as small as they are. It has been hot (80s and 90s) and wet lately. I keep birds away with netting, and I haven’t noticed any bugs besides bees, butterflies and ants in my strawberry bed. and I have gotten bigger strawberries, but not many. I don’t think any of the varieties I planted have THAT tiny of a strawberry. (For the record, I have allstars, tristan, and berries galore, I carefully kept track when I planted) Is there something I’m missing?? Something I could do to encourage bigger berries? If the plants are spaced too closely together, they can develop very small strawberries like you mention. That, or poor soil conditions, can cause smaller berries. There are a number of other things that can affect production as well. Good luck! I live in Warkworth New Zealand and am having problems with my strawberries. We have them in a terra cotta pot at the moment, lots of foliage! But very small strawberries. Not even the shape of strawberries. 🙁 for a little while before we moved to Warkworth the plant had sort of died off, I managed to get it going again (using watered down chicken poop) the plant looks amazing lovely and green but no proper strawberries! Do I need to transfer the plant to a better location? (Ie. bigger pot, or something more suited for strawberries??) your help would be much appreciated! I nearly have up and got rid of the whole plant and starting from fresh again! Chicken poo has very high nitrogen levels. It could be that they have too much of it to want to produce proper strawberries. This may help: 10 Reasons Your Strawberry Plants Don’t Produce. Good luck! Hi! I live in Windsor, Ontario (Canada). Is it possible to grow strawberries here? Yes, it is. They will actually do just fine there, but you need to get a cold-hardy variety and take extra care in the Winter to ensure your plants don’t suffer cold injury. Good luck! I often get non-standard shaped strawberries and I think they’re beautiful. Why should strawbs all look the same? Whilst the supermarkets would reject anything less than perfectly-shaped, IMO home-growers should embrace these natural variations. Vive le difference! For the most part, I agree! And, you are correct about the supermarkets. They have a fairly rigorous quality control system that only allows near-flawless berries to make it into the little plastic trays. But, some deformities make for not-so-tasty strawberries. The natural and HEALTHY funny-shaped strawberries are fine and dandy, but the sick misshaped ones are (or should be!) for the birds. Absolutely. 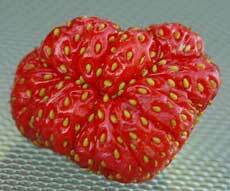 Deformed strawberries are just ugly. I would recommend cutting off the affected parts, however. More than likely, your strawberries are just not quite ripe. If the strawberry is generally normal-shaped with a whitish or green tip, give it a few more days. 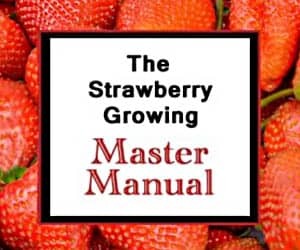 See the Strawberry Picking page for examples of each stage of strawberry ripening. Feeding by certain insects can also cause damage where the tip of the strawberry doesn’t mature. 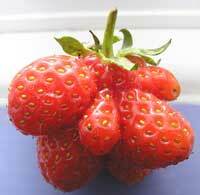 See the page on Deformed Strawberries for more information.